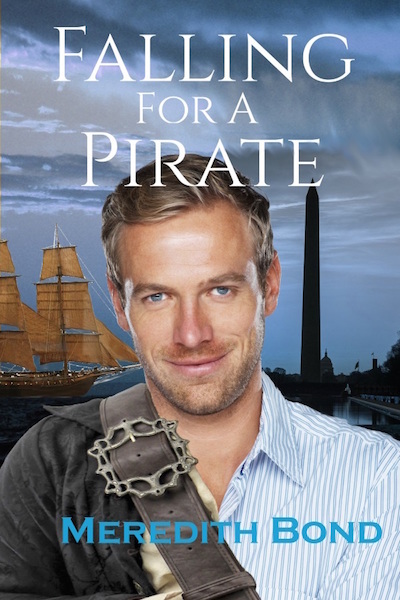 I first learned about Falling for a Pirate when its author, Meredith Bond, signed up to participate in Books Save Lives. Books Save Lives is a project of Readers & Writers for LGBT Chechens that raises funds for the Russian LGBT Network or another charity helping gay men escape Chechnya, where police are currently conducting a campaign of terror against anyone they suspect of being gay. In Books Save Lives, authors or publishers set aside proceeds from book titles over a set time period for these charities. And Bond signed up to donate proceeds from Falling for a Pirate through May 15. Dylan isn’t going to let his ex-fiancé’s issues stop him from going on his honeymoon, but he gets a lot more on this trip to Spain than he anticipated. Tossed overboard while on a romantic cruise, Dylan suddenly finds himself two hundred and fifty years in the past and picked up by ship of Barbary pirates. Salim al-Mandri, who sails the ocean preying on the ships trying to do business with Spain and Portugal, is shocked to find an oddly dressed American fished out of the ocean by a couple of his men. Even more surprising is his attraction to the strange man. Can a relationship between a 21st century pediatrician and an 18th century pirate actually work? The book starts on Dylan’s wedding day with him waiting with his family at the courthouse … and waiting, and waiting. Time keeps passing, but his fiancé doesn’t show up. Every single one of Dylan’s half dozen siblings wants to save the day, and it’s a credit to Bond’s writing that each of these characters was so distinct that I had no problem keeping track of who they were, all through the series of panicked phone calls and conversations with the judge set to officiate the wedding. Dylan starts to suspect that his fiancé isn’t lying dead by the side of the road somewhere, but got cold feet. His suspicion is confirmed when he gets home to their shared apartment to find his fiancé’s clothes gone from the closet and a “Sorry” note on their bed. Dylan’s heartbroken, but not completely surprised. Wishing to get the better of the situation, he decides to go on his honeymoon trip to Spain anyway—and ends up traveling more than two centuries back in time as well. Dylan’s reaction to time-travel is much like his reaction to his fiancé disappearing. He wasn’t expecting it, but he’s not shocked, either. Magic runs in his family and he’s been in other situations he can’t easily explain. So when he survives a near-drowning and discovers his rescue ship is full of actual 18th-century pirates and not reenactors, he decides that the best thing to do is to accept what has happened and adapt. Besides, the ship’s captain, Salim al-Mandri of Algiers, is really damn attractive. He might just be the perfect rebound. And given that Dylan doesn’t plan to stay in the 1700s forever, there wouldn’t be any consequences, right? I haven’t read many pirate romances, so I can’t say whether Falling for a Pirate adheres to common tropes. But I can say that I had fun reading it. I liked learning about life on the seas and Dylan’s continuous culture shock when dealing with the crew. I was also pleasantly surprised that Bond didn’t shy away from highlighting the morally dubious aspects of piracy (you know, like kidnapping, enslavement, and murder), even as it shows that many legally sanctioned vessels were committing similar crimes against humanity (you know, like the trans-Atlantic slave trade). Yes, “legal” slavery is bad, but illegal slavery is no better. On the face of it, a time-traveling magical pirate story wouldn’t seem to have much to do with modern Chechnya. But I found connections anyway while reading Falling for a Pirate. Salim al-Mandri is a lover of literature and often quotes from the mystical Sufi poets Hafez, Rumi, and Amir Khusrau. Sufism is a school of Islam, the majority religion of Chechnya. In fact, Sufism was long the predominant strain of Islam in the northern Caucuses, though recent years have seen the growth of Salafism, which emphasizes more literal interpretations of Islamic texts and implementation of sharia (Islamic law). And it’s a question that we all should ask ourselves every day—including the Chechen police. And it becomes a crucial question for Dylan, who’s not sure how to square his affection for Salim with his revulsion for violence. Pieces of Sufi and mystical poetry introduce each chapter of the book, foreshadowing what lies ahead for our heroes. Sometimes it’s happiness together, and other times it’s not. But at the end of the tale, we know that Dylan has found someone to love for good. Check out all the books whose royalties are helping LGBT Chechens. Browse my other book reviews. Thank you so much, Dale for a lovely review and for all you’re doing for the Chechnyans! I’m proud to be a part. My pleasure! And guess what? I just learned today that Sufism is historically the predominant strain of Islam in the Northern Caucuses. I just added a couple sentences about that to the review. The connections are even deeper than I’d thought. And now I’m curious to read more pirate stories.